Congratulations to Joy McCoy of Hillsboro, Oregon! She has won Ms. Celiac's Holiday Giveaway! This lucky reader will receive 3 boxes of Elisabeth Hasselbeck's Gluten Free Nogii Bars! This includes the Super Protein Bars, the High Protein Bars, and the Kids Bars! Thank you to everyone who entered and stay tuned to Ms. Celiac Says... for upcoming contests and giveaways! For more information on Nogii products, please visit their website at www.nogii.com! To kick off the holiday season, I've been given the opportunity to award one lucky reader an amazing prize package from Elisabeth Hasselbeck's Nogii brand. To enter, all you need to do is send an email to MsCeliacSays@gmail.com with "Nogii Giveaway" in the subject line and your name and mailing address in the body of the email. Entries will be accepted until Sunday, December 4th at 12 noon EST. The winner will be announced shortly after. Enjoy Life has recently repackaged and reinvented their gluten free trail mix! They also sent me samples so that I could check it out for myself! Enjoy Life's Not Nuts! 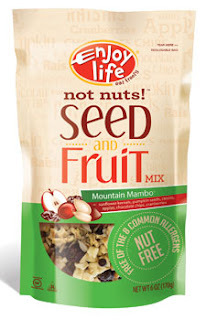 Seed and Fruit Mix is not only gluten free but dairy free, peanut free, tree-nut free, soy free, egg free and casein-free. My favorite is the Mountain Mambo which includes sunflower kernels, pumpkin seeds, raisins, dried apples, cranberries and chocolate chips! The Beach Bash is also tasty and includes sunflower kernels, pineapple, pumpkin seeds, cranberries and apricots. Gluten Free Classic Soft Pretzels! I was recently sent some gluten free soft pretzels from the brand, Kim & Scott's. I wanted to share these with all of you because they are so delicious plus they are extremely easy to make! Kim & Scott's Gourmet Gluten-Free Bavarian Classic Soft Pretzels are all natural and contain 5 grams of whole grains! They are also made in an allergy-aware and nut-free bakery! If you choose to make them in the microwave, you just have to heat the pretzel for less than a minute and then take it out, wet it with a damp napkin and pour on the salt! They provide you with a lot of salt, so feel free to add as much as you like without worrying about running out of salt for your next pretzel! For more information, please visit www.kimandscotts.com! Recently I got to try the Italian restaurant Bar Italia, which is located on the Upper East Side of Manhattan. They offer a gluten free menu which can be found at the back of their regular menu. I enjoyed the gluten free Spaghetti al Tartufo with Black Truffle and Parmigiano (photographed to the right) for my entree. It was delicious but very rich and extremely filling! For dessert, I had the gluten free Tiramisu (photographed below) which in addition to being gluten free was vegan and a raw food dessert! One of their chefs is a raw food gourmet chef! It was also delicious and it was hard to believe that it was also vegan! The gluten free menu offered a wide selection of gluten free pastas and pizzas! For more information, please visit their website at www.baritalianyc.com or visit them at 768 Madison Avenue at 66th Street! Crunchmaster's Newest Gluten Free Crackers! 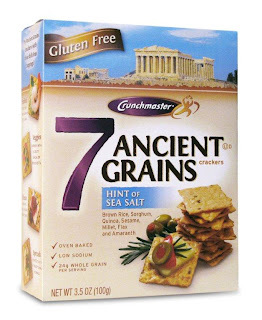 I have tried some of Crunchmaster's gluten free products in the past, so I was happy to receive a box recently from Crunchmaster with two of their newest gluten free crackers - White Cheddar Multi-Grain Crackers and 7 Ancient Grains Hint of Sea Salt Crackers. Both crackers were very good! I enjoyed the 7 Ancient Grains Crackers with a hummus dip and it was absolutely delicious! They are oven baked with brown rice, sorghum, quinoa, sesame, millet, flax and amaranth! In addition to being certified gluten free, Crunchmaster crackers are free of saturated fats and cholesterol and are made with 100% whole grains. They are also a good source of fiber! 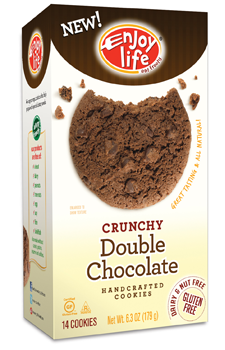 Crunchmaster products can be found at health food stores and at Ms. Celiac's Market. For more information, please visit their website at www.crunchmaster.com. I've been extremely busy this past month, but I wanted to take time to tell you about some new gluten free products I've discovered. They are available to purchase at Ms. Celiac's Market! 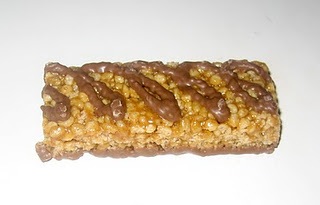 Also, Elisabeth Hasselbeck's Nogii brand released a nutrition bar for kids - Nogii Kids is a sweet snack bar that tastes very similar to a Rice Kripsies treat! In addition to being gluten free, it is nut free and contains no high fructose corn syrup! Nogii Kids bars are also available to purchase at Ms. Celiac's Market! My new gluten free obsession are Julie's Organic Gluten Free Ice Cream Sandwiches! They contain vanilla ice cream sandwiched between two chocolate sandwich cookies. They are available at Whole Foods and many other health food stores! 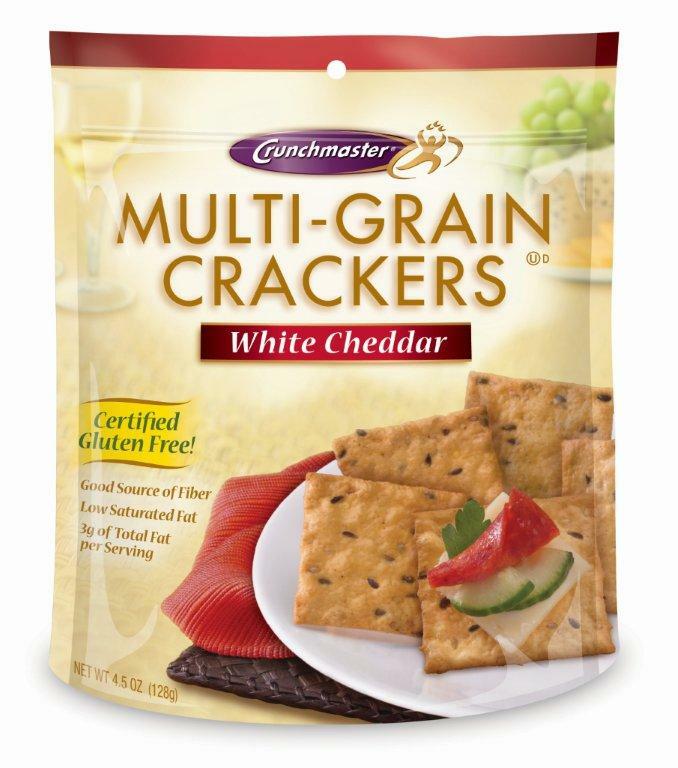 I also received the other day some new gluten free crackers from Crunchmaster. I will be sure to try them out and report back to you! Also, keep checking Ms. Celiac's Guide to New York City as I am continually updating it with new gluten free places! Pret A Manger is a chain of cafes with locations in the USA, UK and Hong Kong. In the USA, you can find these cafes in New York, Washington DC, and Chicago. When visiting the Pret A Manger website at www.pret.com, you can find out a lot of information on what's in all of their menu items. They will list whether or not each item is gluten free or vegan or vegetarian or if it contains nuts. For more information, visit their website at www.pret.com. Ms. Celiac's Guide to New York City! For the past several months, I have been working on assembling a list of all the places in New York City that accommodate those on a gluten free diet. I then took this information and created a Google map called, "Ms. Celiac's Guide to New York City." Ms. Celiac's Guide to New York City focuses on the boroughs of Manhattan and Brooklyn. This map includes places that provide a gluten free menu, select gluten free items or just accommodate a gluten free diet. I've also included links to reviews that I have written on several of the restaurants. This map is perfect if you're going to be in a certain area and want to know what gluten free friendly places are around - you can just zoom into your neighborhood and see! There are places everywhere! Currently the list includes over 100 bakeries, cafes, restaurants, etc. I will be adding to this list as new places pop up! Pass it along and enjoy! Gluten Free Baked Goods in Park Slope, Brooklyn! I was in Park Slope, Brooklyn earlier this week and was able to check out the Red Horse Cafe. The Red Horse Cafe is a coffeehouse that now offers a large selection of gluten free baked goods from Las Delicias. While there, I tried a gluten free Dark Chocolate cookie - it was definitely the perfect treat for a chocolate lover as it had an intense chocolate flavor! I was also able to enjoy a gluten free Banana, Fresh Ginger & Walnut Muffin. This was absolutely delicious and I'm looking forward to going back and having this again! The muffin was made out of an assortment of gluten free flours including garbanzo flour, sorghum flour and fava bean flour! The Red Horse Cafe is located at 497 6th Avenue (between 11th and 12th streets) in Park Slope. The next time you are in the area, I recommend checking it out or even if you have to make a special trip out to Park Slope, it's well worth it! Looking for a delicious gluten free salsa to use with your tortilla chips? Then you should try out one of the salsas by Dei Fratelli! Dei Fratelli recently sent me an assortment of their products including salsas, canned tomatoes, and pasta sauces! All are gluten free and certified Kosher. Dei Fratelli products are available at grocery stores and at Ms. Celiac's Market! 2 New Gluten Free Cookbooks! Do you need to cook gluten free but don't have the time to do so? Well, Roben Ryberg, author of You Won't Believe It's Gluten-Free!, has released another cookbook entitled, Gluten Free in Five Minutes. This cookbook is perfect for the student living in a college dormitory as the recipes are made using only a microwave! 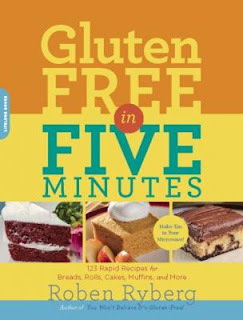 The book includes chapters on breakfast, breads, rolls, flatbreads, tortillas, pizza crusts, sides, yellow cakes and white cakes, chocolate cakes, other cakes, icings, snack cakes and cookies, quick breads and muffins and other desserts. Do you have the time to cook but are looking for gluten free inspiration? Then you should check out the Cooking Light Gluten-Free Cookbook - Simple Food Solutions for Everyday Meals. 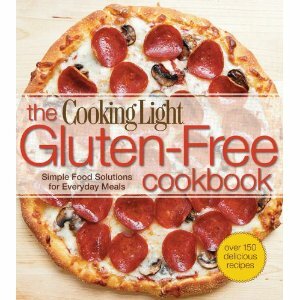 This book, from the editors of Cooking Light magazine, includes over 150 delicious gluten free recipes! They took some of their classic recipes and made substitutions to ingredients to make them gluten free. This book includes chapters on Appetizers and Snacks, Breakfasts, Main Dishes, Pizzas and Pastas, Sandwiches and Soups and Desserts. This cookbook also includes mouthwatering photographs of each of the recipes! Both cookbooks are available to purchase at Ms. Celiac's Market! I also got to visit two delicious bakeries including the gluten free paradise, Mariposa Baking Co. and Kara's Cupcakes! 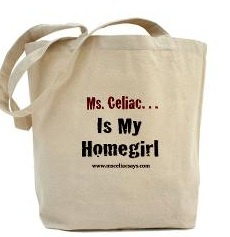 Ms. Celiac Says... has now been in existence for 2 1/2 years! We've had visitors from all 50 states and practically every single country and we are very thankful for all of our loyal visitors! At this point, we have reached just over 40,000 unique visitors to our site, about 1000 followers on Twitter and we are almost at 100 "likes" on Facebook! If you haven't yet, please start following us on Twitter by clicking here @MsCeliacSays and "like" us on Facebook! Starting this fall, I will be attending law school in the NYC area. I will still write on occasion and try to keep everyone up-to-date with the latest gluten free happenings but I will not be writing as much as I have in the past. A great way to stay up-to-date on the latest news is to follow @MsCeliacSays on Twitter! Also, feel free to email me at MsCeliacSays@gmail.com with any comments, questions or suggestions. I always read every single email and appreciate all of your feedback! I would like to thank the following brands for sending me delicious treats these past two months - GoPicnic, Betty Crocker (courtesy of MyBlogSpark), Bakery on Main, Enjoy Life Foods, Katz Gluten Free and Luna Bar! Please take the time to check out these brands and their sites! For more information, visit the Williams-Sonoma website! Also, if you're interested in purchasing products to display your gluten free pride (like the tote bag pictured above) then check out Ms. Celiac's Shop! There are some great options to choose from! That is all for now! Happy August! I finally got around to trying Pure Food and Wine. This is a raw food vegan restaurant that is in my neighborhood that I have been wanting to try for quite some time. There are many gluten free options on the menu and they are all marked with notations indicating that they are gluten free. I decided to have their Zucchini and Tomato Lasagna which is one of their specialties. This is made with a sun-dried tomato sauce, pistachio basil pesto and pumpkin seed macadamia ricotta. It is not your typical lasagna as there is no cheese or pasta and it is a cold entree. For dessert, I enjoyed their delicious Moon Pie - a chocolate brownie vanilla cream sandwich! I also was able to bring home an Oreo cookie. One of the nice things about Pure Food and Wine is their beautiful private back outdoor garden seating that transports you out of the busy and noisy city. Also, all of the water in the restaurant is filtered through a Tensui water filtration system! If you just want something quick to takeaway, try out their other restaurant, One Lucky Duck Juice Bar and Takeaway. It sells raw vegan juices, shakes, ice creams, cookies, desserts and other takeaway items. There are two locations - one in Gramercy Park and the other at Chelsea Market. Today is the last in the series of posts on San Francisco's gluten free restaurant scene and I chose to end it with one of my favorite restaurants, The Slanted Door. The Slanted Door is a modern Vietnamese restaurant owned by Charles Phan and located in the Ferry Building. They serve a large menu of delicious food using only the freshest ingredients possible. Charles Phan also owns a small chain of restaurants called Out The Door which brings similar cuisine to a wider audience (the menu is less expensive). Out The Door has locations in the Ferry Building, the Westfield Shopping Centre and on Bush Street. The Slanted Door does not provide a gluten free menu but the waitstaff are very aware of which items are gluten free or can be made gluten free - almost everything on the menu can be altered in some way to be made gluten free! Out The Door provides a gluten free menu for its diners. While in San Francisco, I went to The Slanted Door once and to Out The Door at the Westfield Centre twice. The portions at The Slanted Door are large and meant for sharing. We ordered the Slanted Door Spring Rolls with Shrimp and Mint to start. For the entrees, we ordered Stir Fried Organic Chicken with Gingko Nuts, Raisins, Walnuts and Cashews along with Caramelized Wild Gulf Shrimp with Garlic and Onions. For sides, we ordered Chue Farms Baby Bok Choy with Shitake Mushrooms, Allstar Organics' Snow Peas with King Oyster Mushrooms and Jasmine Rice. And for dessert, I was able to have the cotton candy with a small selection of homemade candies! Everything tasted so amazing! When dining at Out The Door both times I ordered the same shrimp dish that I had at The Slanted Door with a side of jasmine rice. I became so addicted to the food at this restaurant while I was in San Francisco that I was ecstatic to learn that they will be opening a location of The Slanted Door in NYC in early 2012! All I know as of now is that it will be located in the Met Life Building. I cannot wait to go when they open! Congratulations to the winner of the Katz Gluten Free Giveaway! Jackie Coughlan of High Bridge, New Jersey will receive 5 products from Katz Gluten Free! Thanks to everyone for entering! Stay tuned for more contests! If you're in San Francisco and looking for a big lunch, you should check out the American Grilled Cheese Kitchen! As the name implies, they offer a variety of different types of grilled cheese sandwiches including ones made with gluten free bread! The place offers some indoor seating but most tables are outside and it gets crowded, so there can be a wait for tables. I ordered a Gluten Free Mousetrap. This was made using Tillamook Sharp Cheddar, Creamy Havarti and Monterey Jack on Gluten Free Bread. The sandwich was delicious but huge! Half of a sandwich was really more than enough for a meal! Also, all grilled cheese sandwiches are served with an orange. They also sold an assortment of gluten free potato chips by the brand, Deep River Snacks. I had the Rosemary Potato Chips and they were amazing! We ventured outside San Francisco one day to Berkeley, where we got to go to the famous Chez Panisse Cafe. Chez Panisse doesn't have a gluten free menu but since they use mostly very simple ingredients they are very easily able to accommodate someone on a gluten free diet. For my appetizer, I had the Smoked Salmon which was delicious! My main course consisted of California Sea Bass with Romano Beans, Purslane, Cherry Tomatoes and Aioli. For dessert, I got to enjoy their Bittersweet Chocolate Ice Cream. Everyday the menu changes, so you are always in for a nice surprise and are able to try new things! I visited Mariposa, an artisan-crafted gluten free bakery, several times during my stay in San Francisco. Their gluten free baked goods were absolutely delicious! Unfortunately, I didn't get a chance to visit their main location in Oakland but their location at the San Francisco Ferry Building stocked quite a lot of options! Mariposa sells an assortment of gluten free biscotti, brownies, cookies, squares, coffeecake, cupcakes, crostini, bagels, pizza crusts, cinnamon rolls and breads! I was able to try their Chocolate Chip Cookies, their Penguino cupcakes (chocolate on the outside, vanilla cream on the inside), their Sour Cream Coffee Cake and their Cinnamon Rolls! In addition to being gluten free, many of their items are dairy free and/or vegan. My favorite item was the cinnamon roll! It was out-of-this-world delicious! In fact, I bought several so that I could enjoy one every morning with my Starbucks coffee while in San Francisco. For those of you who aren't in San Francisco, you can order many of their items online by visiting their website at: www.mariposabaking.com. Another great place that didn't have a gluten free menu but was very accommodating with a gluten free diet, was the restaurant Boulevard. Here I started with the Bruin Farms Tomato Salad. This included buffalo mozzarella, shaved market squash and parmesan colatura tuile, pine nuts and arbequina extra virgin olive oil. For my entree, I enjoyed the Pan Roasted Hawaiian Walu and Gulf White Prawns which came alongside butterball potatoes with grated heirloom tomatoes, chili flake and parsley, baby artichokes, fava beans, and lemon relish. And for dessert, I had the Chocolate Angel Pie. This was a tainori chocolate mousse with a vanilla meringue crust, banana caramel and chocolate sauce with bananas foster. It was delicious! When visiting Ghirardelli Square, I came across a cupcake bakery that sold a few different types of gluten free cupcakes along with regular cupcakes. I ended up purchasing 2 gluten free cupcakes and decided to save them for later. However, due to presumably an outdoor heat lamp at lunch (San Francisco was freezing so it wasn't the climate) the cupcakes melted and I didn't get a good photograph of them. They still tasted delicious, just ended up looking like a mess. To get an idea of how beautiful they usually look, visit their website at www.karascupcakes.com! The gluten free varieties they make include Sweet Vanilla (Vanilla Cupcake with Sweet Madagascar Bourbon Vanilla Frosting), Chocolate Velvet (Chocolate Cupcake with a Velvety Bittersweet Chocolate Buttercream) and Coconut (Vanilla or Chocolate Cupcake with a Coconut Cream Cheese Frosting). I was able to sample both the Sweet Vanilla and the Chocolate Velvet. They both came with a sugar flower on top! They also sell Kara's Cupcakes at SFO airport in Terminal 2! For more information, check out their website at www.karascupcakes.com! After taking a tour of the vineyards at Domaine Chandon, we went for lunch at their restaurant Étoile. They did not have a gluten free menu but everyone was very aware of how to alter menu items to be gluten free! For my meal, I chose to have the roast chicken with vegetables and for dessert I was able to sample an assortment of sorbets including coconut, mango and pear. Of course, I also enjoyed one of their famous sparkling wines with my meal. For more information, please visit their website at www.chandon.com/etoile-restaurant.html. After a long day in Napa Valley, we decided to get a quick bite to eat at Pica Pica Maize Kitchen (the San Francisco location - they have a location in Napa too!). It reminded me of Caracas Arepa Bar in NYC. Pica Pica Maize Kitchen offers a large assortment of arepas (grilled corn flour cakes), cachapa (100% sweet corn pancakes) and maize'wich (sweet corn bread). Everything on the menu is gluten free so there is no risk of cross contamination. I enjoyed the Arepa Pepeada. This was a chicken salad made with guasacaca (creamy avocado) as opposed to mayonnaise. It was delicious and just the right size! For more information, please visit their website at www.picapicakitchen.com! I was extremely excited to try Bar Bambino in San Francisco's Mission District. I had heard they have their own homemade gluten free pasta - having never enjoyed homemade gluten free pasta this was to be a real treat! Although there is no gluten free menu at Bar Bambino, everyone is very aware of which dishes are gluten free or can be made gluten free and which ones are off limits. I ended up having a special vegetarian gluten free pasta dish made for me. It was homemade gluten free pappardelle with roasted squash in garlic and oil. The gluten free pasta was amazing! The portions were fairly small but the pasta tasted so fresh and delicious! For dessert, I enjoyed the Schwarzwalder with Liquored Cherries - Bar Bambino's version of a Black Forest Cake. Their menu describes it as "boozy cherries, on top of a knock-your-socks-off TCHO chocolate cake, alongside whipped Kirsch cream." Luna Protein is Gluten Free! Way back before I started on a gluten free diet, my favorite nutrition bar was made by the brand, Luna! So, I was extremely happy to hear that they were releasing a line of gluten free protein bars! A few weeks ago, I was sent a sample package of some of their new gluten free bars. I got to try the Mint Chocolate Chip, the Cookie Dough and the Chocolate Peanut Butter! My favorite of the three, was the cookie dough bar! They are all covered in chocolate and make for a nice pick-me-up! These bars are fairly small, so they travel easily. In addition to the flavors I mentioned above, they come in Chocolate Cherry Almond and Chocolate. Each bar is under 200 calories and contains 12 grams of protein and 3 grams of fiber. They are also rich in calcium, iron, vitamin D and folate! Luna Protein bars are available to purchase at grocery stores and health food stores. They are also available at Ms. Celiac's Market. For more information, please visit www.lunabar.com. I would have to say that my favorite restaurant in San Francisco was The Plant Cafe. I went there twice - once for a weekend brunch and another time for lunch. They have a few locations within San Francisco, however, both times I went to their location at Pier 3 at the Embarcadero. The Plant Cafe has an assortment of options that accommodate almost any diet. They have vegetarian, vegan and gluten free choices clearly marked on their menus and most items contain only organic ingredients. The first day I went there for brunch. The gluten free options on the brunch menu were more limited than on the lunch menu. You could choose from gluten free granola and a large assortment of salads. I chose the Housemade Granola which was absolutely delicious! It came with an assortment of fresh fruit and a side of soy milk! I also was able to enjoy a hot glass of Yerba Mate with my brunch. In fact, when I was at the airport (SFO's terminal 2 has a Plant Cafe!) I was hoping that they would be selling the granola because I was absolutely craving more of it (unfortunately, they didn't have the granola). The second time I went to the Plant Cafe was for lunch. This time I ordered the Fish Taco Plate - grilled fish, black beans, shredded cabbage, mango-avocado salsa, crema, corn tortillas! It was amazing! The fish and all of the ingredients tasted so fresh! For dessert, I enjoyed the Raw Raspberry Cashew Cheesecake - young coconut, pecan-date crust, blackberry pepper sauce. I must say that I was a bit hesitant about trying a raw vegan cheesecake but it was delicious! Gluten Free in San Francisco! At the end of June, I visited San Francisco. I had heard that this city provided a multitude of great gluten free dining options but I was still truly surprised at how aware people were of the gluten free diet! From the homemade gluten free pasta at Bar Bambino to the enormous gluten free grilled cheese sandwiches at the American Grilled Cheese Kitchen to the delicious fish tacos at The Plant Cafe, I was able to sample an amazing selection of gluten free food! Katz Releases New Products + Giveaway!!! 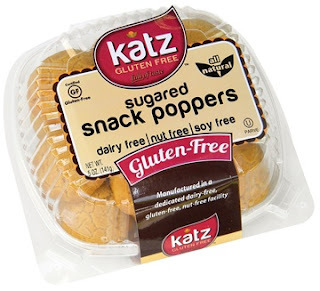 Katz Gluten Free recently sent me some of their new products to sample and review. I received a box filled with an apple pie, a coffee bundt cake, and sugared snack poppers. 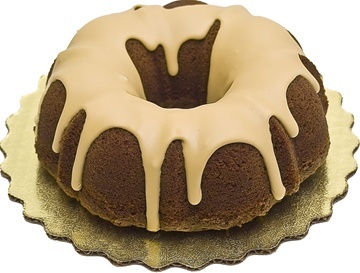 The coffee bundt cake was truly one of the most amazing gluten free products I have yet to try. The cake was nice and moist and the coffee flavored icing was to die for! The apple pie was also a delicious treat! Katz Gluten Free recently released pies with cherry and blueberry fillings too! The sugared snack poppers which are also available in a regular variety make for a great mid-afternoon snack! They are the perfect size with just the right amount of flavor! If you would like to win 5 Katz items, please send me an email at MsCeliacSays@gmail.com with your name and address in the body of the email and "Katz Gluten Free Contest" in the subject line by Thursday, July 28th, 2011 at noon EST. And to stay up-to-date with the latest Katz news, make sure to "like" them on Facebook and to follow them on Twitter! For more information, please visit KatzGlutenFree.com! Congratulations to Jennifer Ryalls of Chandler, Arizona! She is the winner of our Betty Crocker Giveaway! She will be receiving all of the Betty Crocker baking mixes (Chocolate Chip Cookie, Chocolate Brownie, Yellow Cake and Devil's Food Cake Mix) plus the Bisquick Gluten Free Baking Mix. Thanks again to Betty Crocker and MyBlogSpark for providing us with this product, prize pack, information and giveaway! If you would like a chance to win this prize pack, please send an email to MsCeliacSays@gmail.com. Make sure to write "Betty Crocker Giveaway" in the subject line and to include your name and address in the body of the email. All entries must be received by Monday, June 20th at 9 am EST. One winner will be chosen to receive the above prize pack. This product, prize pack, information, and giveaway have all been provided by Betty Crocker through MyBlogSpark.